A few days after Japan lost the war, thick clouds of smoke spewed from government and military facilities as mass amounts of documents were burned. It was an organized cover-up to thwart investigations by the allied forces. Because of this more than half of Japan’s secret documents were lost, we lost our chance to get a handle on the full scope of the war. It’s a classic example of how the bureaucracy has no vision for making information public. Politicians aren’t much different. When Prime Minister Eisaku Sato achieved the return of Okinawa, his profession of the three basic principles of non-nuclear arms won him the nobel peace prize. In the background, was a secret treaty that the Prime Minister had made with President Nixon. The former Prime Minister never informed the Ministry of Foreign Affairs about these secret negotiations and even kept the records of the agreement meeting hidden in his own home. There’s an old Chinese saying, “It’s enough to make the people obey the law, there’s no need for them to understand it.” —That kind of though definitely permeates and is carried over into the State Secrets Act. There is no punishment for bureaucrats or politicians that unjustly hide information. There is no fair and balanced third party oversight group to check whether the release of information is justified or not. The only thing to determine what is a secret is the capricious decisions of the administration. In the ever growing number of secrets, the truth will be sucked up. 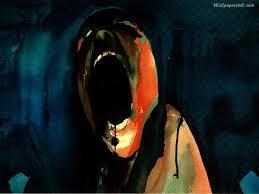 From the bottom of our hearts we should fear the arrival of such a rigid and crushing society. Seven months after the State Secrets Act was passed, the Abe Cabinet approved the collective self-defense interpretation of the constitution. The Manchurian Incident began with a Japanese Army plot. The Japanese people were only told the truth during the Tokyo War Crimes trials. We shouldn’t let history repeat itself. Against this evil law, we must not remain silent and we must continue to raise our voices in protest. Tanaka Minoru, the journalist who almost sued into silence for pointing out past ties to organized crime in relation to Japan’s nuclear industry shadow shogun and ‘fixer), Shiro Shirakwa, summarizes the problems with law succinctly. 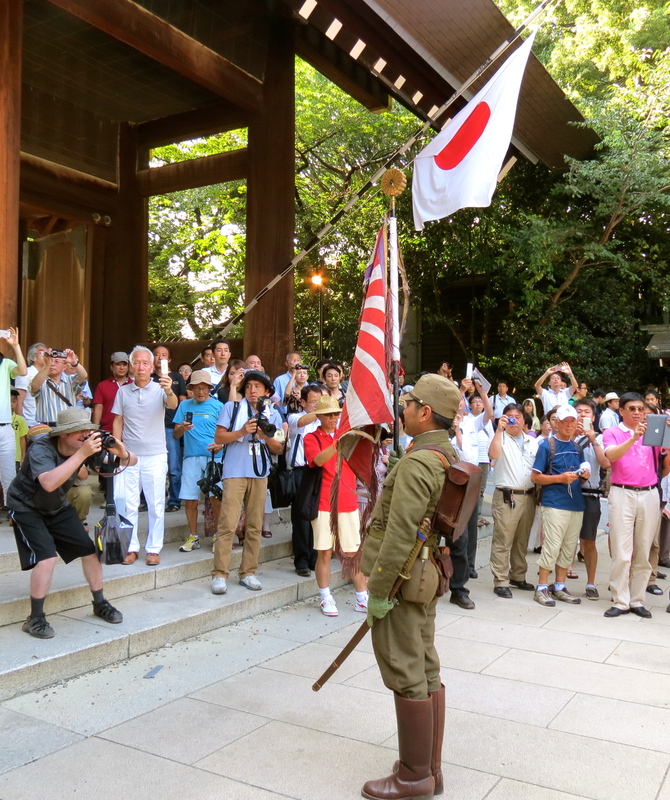 Under the bright and sweltering sun in Japan yesterday (August 15th), the controversial shrine of Yasukuni in Tokyo again received nonstop ordinary citizens’ visits from morning until sunset to mark the 68th anniversary of the end of the Pacific War. Also, as every year, not far from the shrine, an estimated 200 political activists from the Far Left group Han Tennosei Undo Renraku-kai, (反天皇制運動連絡会) or the “Anti-Emperor of Japan activists,” who believe that Japan’s surrender should have been the fall of its emperor, participated to a protest march in the streets of Tokyo protested by approximatively 40 to 100 Japanese nationalists who may have been from the Zaitoku-kai, (在日特権を許さない市民の会) or the “Citizens’ Group Opposed to Special Privileges given to the Zainichi (Koreans),” (long-term Korean or North Korean residents in Japan,) dispersed and potentially disguised under a group they called the “Rekishi Kenkyu-kai,” (歴史研究会) or the “History Investigation Group.” The Japanese police PR office could not release the exact number of elite police forces present at today’s Anti-Emperor demo, but it was believed that more than a thousand of super-well-equipped police officers were running around to protect the demonstrators from the pro-emperor activists. August 15th 1945 was Japan’s official surrender. Six days after American aircrafts had dropped the atomic bombs on Hiroshima (August 6th) and on Nagasaki (August 9th), Emperor Hirohito announced over the radio that the country would lay down its arms and accept the terms of the Potsdam Declaration unconditionally. Over 2 million Japanese including civilians died during World War II and over 10 million Chinese people are estimated to have lost their lives during the same period. For some Japanese people this day marks the the beginning of peace, and for others it marks the humiliation of losing the war against the western allies. “Today is the day the Japanese people suffered the humiliation of losing the war against the western allies. It’s the anniversary of the end the war,” A former yakuza boss said as he woke up yesterday morning. “Let’s pray for those who fought to protect the Japanese nation.” He added. 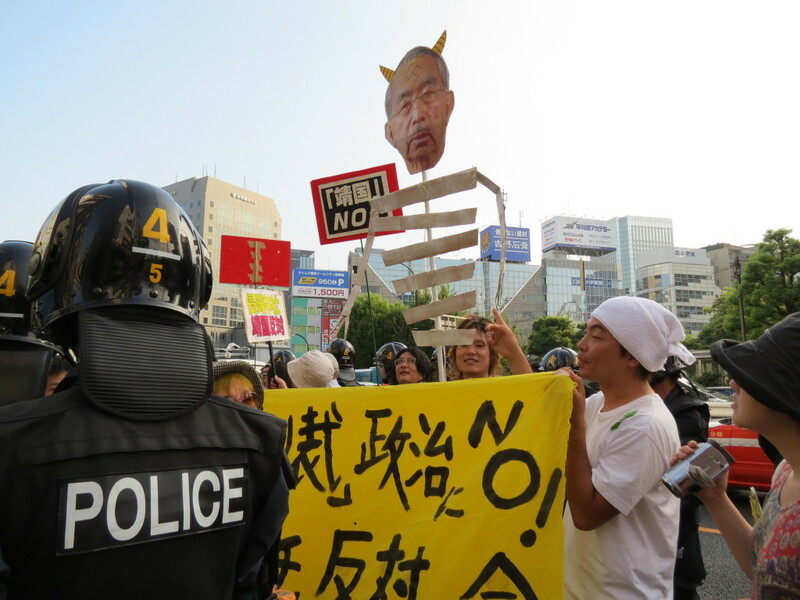 Anti-Japanese Emperor activists carry the image of the Japanese emperor with a skeleton body. Since the LDP (Liberal Democratic Party of Japan) came back to power last year under the leadership of Prime Minister Shinzo Abe, who is trying to change the current pacifist Constitution in order to empower Japan’s defense military forces, a shift to the right by the new Cabinet is increasingly raising fears among Japan’s neighbors. It’s “a dangerous revival of its military past,” the Chinese media reported. 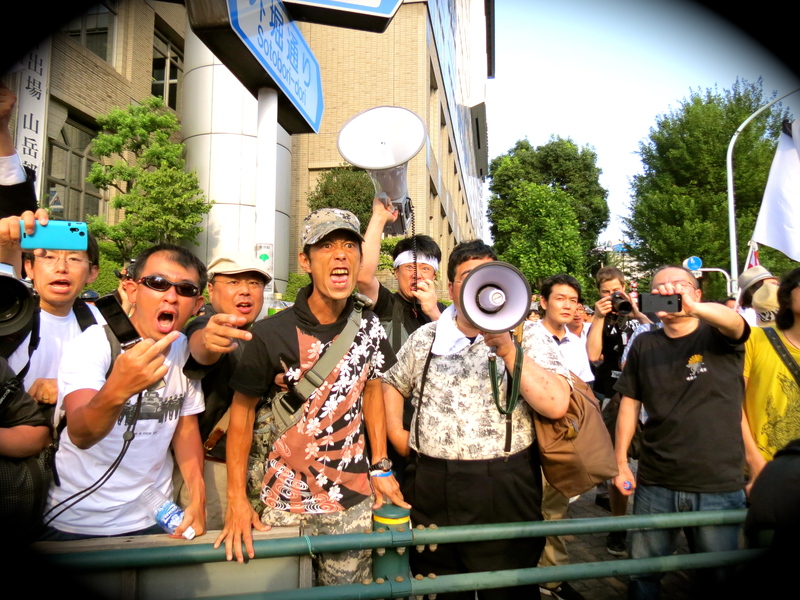 “If Japan had to go on war, I would fight it to protect my country with no hesitation,” Keinosuke Nakai, 42, a member of the Hinomaru Tomo no Kai, a Japanese nationalist group, told JSRC at a meeting held at the Daisuisendo Kaikan bld’s 4th floor, two steps away from the ultra leftist group’s meeting room filled with about 200 activists, where no photos and no footages of the meeting was allowed to be taken. The tension was palpable. In the room on the right side on the same floor, a man who appeared to be a leader said, “Today is the commemoration of Japan’s loss of the war. 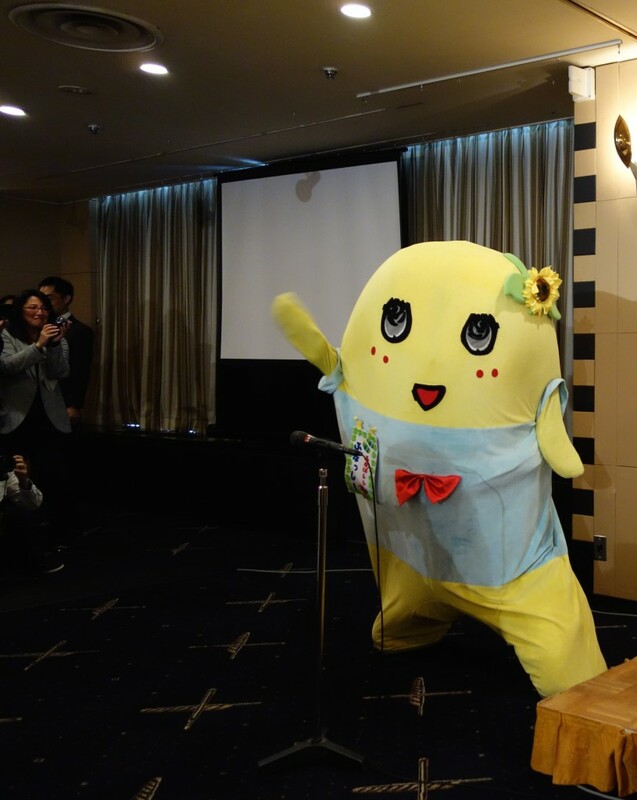 But remember, next time Japan will win the war.” He was applauded by his audience of about 30 nationalists. 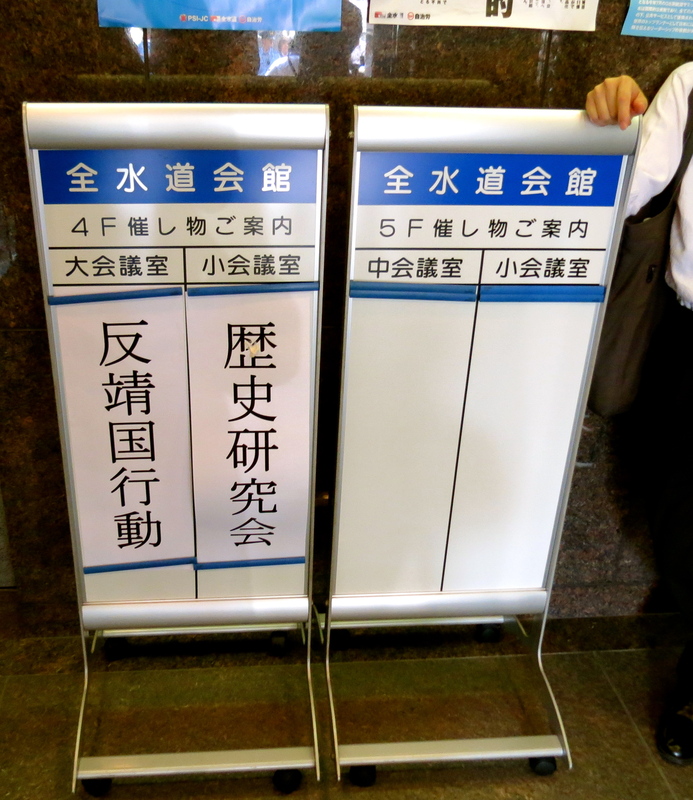 The Far Left Group on the left and the Nationalists on the right, they met in the same building on the same floor! In Seoul on Thursday, the South Korean President Park Geun Hye urged Japanese politicians to show “brave leadership” in “healing wounds of the past,” at a speech she gave during a ceremony marking the Korean National Liberation Day, as Japan’s 35-years occupation period from 1910 to 1945 ended. In Tokyo the same morning, Internal Affairs and Communication Minister Yoshitaka Shindo and state Minister in charge of North Korea’s past abductions of Japanese nationals, reportedly visited the controversial Yasukuni Shrine for the 68th anniversary of Japan’s surrender in WW II. Instead of visiting the Yasukuni Shrine, Prime Minister Shinzo Abe reportedly visited the Chidorigafuchi National Cemetery in Tokyo, where he laid flowers for unidentified Japanese people who died overseas during WWII. He also met with the visiting chairman of the U.S. Senate Foreign Relations Committee, Robert Mendez, and agreed with him that Japan and the United States should strengthen bilateral ties as China increases its presence in the South China and East China seas. 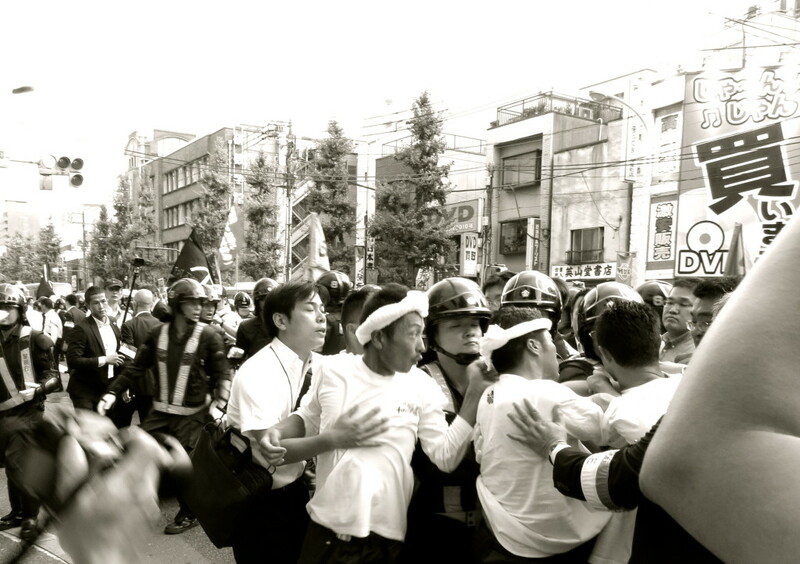 Although Prime Minister Abe did not go to the controversial shrine in person this year to avoid further issues with China and South Korea, Xinhua, the Chinese state-run news agency reported that this morning’s visits by the two Cabinet ministers will “further harm mutual trust between Japan and its neighbors.” The Chinese view is that Japan should/must reflect upon its history of aggression, and sincerely apologize to the victims of its military past. 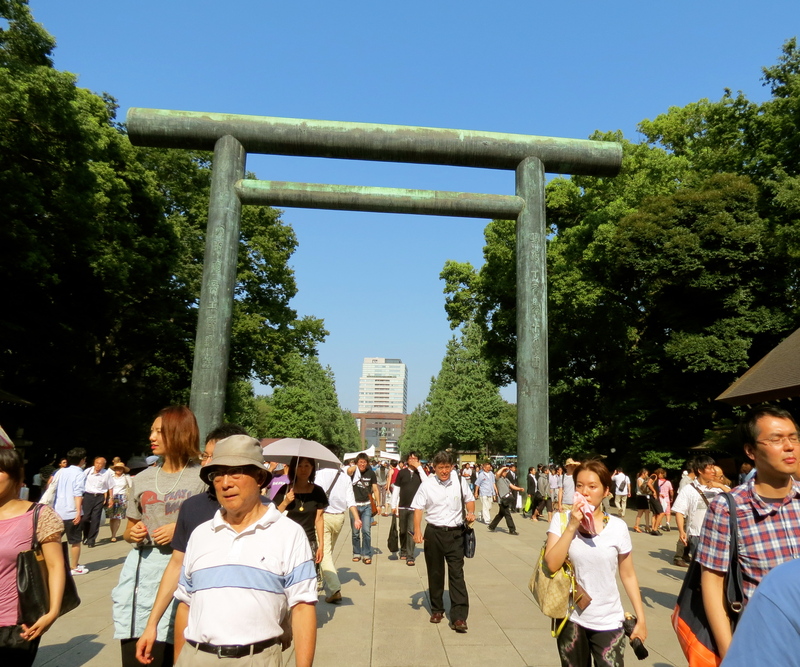 Yasukuni Shrine, which is dedicated to about 2.5 million Japanese people, mostly soldiers killed in past wars, (not only WW II), is viewed by neighboring Asian countries as a symbol of Japanese militarism. Fourteen Convicted Class-A war criminals are also enshrined there. But the Japanese people who pay a visit to the war dead do not necessarily honor war criminals. They might pray for one or two of their ancestors who died at war. But in a statement released by China’s Foreign Ministry, Vice Foreign Minister Liu Zhenmin and Japanese Ambassador to China, Masato Kitera, strongly protested the visits to the controversial shrine in Tokyo by the two Cabinet ministers. China holds that “no matter in what form or capacity Japanese leaders visit the war-linked shrine, it is essentially an attempt to deny Japan’s history of militarism and invasion of its Asian neighbors.” The statement said. 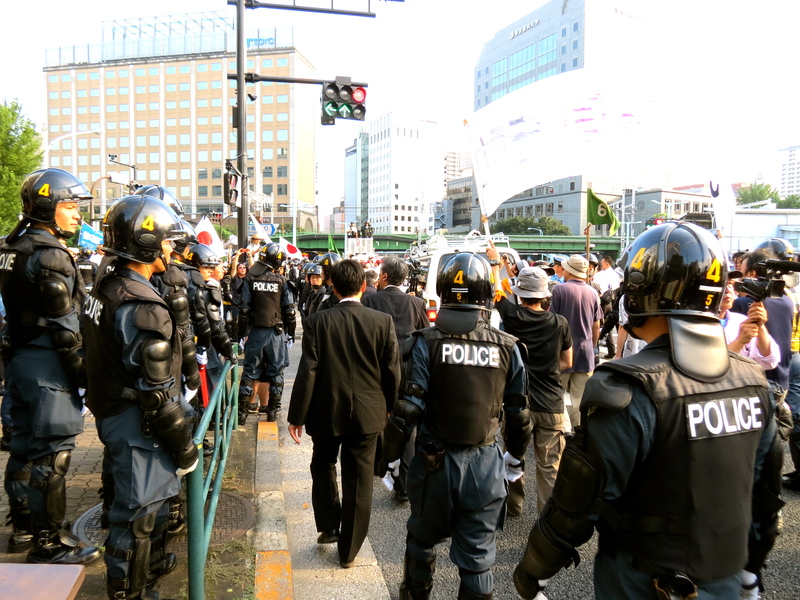 The Japanese police force trying to maintain order during the Anti-Emperor demo. The police squad reached a huge number. This also marked the first year in over a decade that the current Prime Minister did not apologize for Japan’s aggression in Asia nor solemnly swear that Japan would never wage war again. 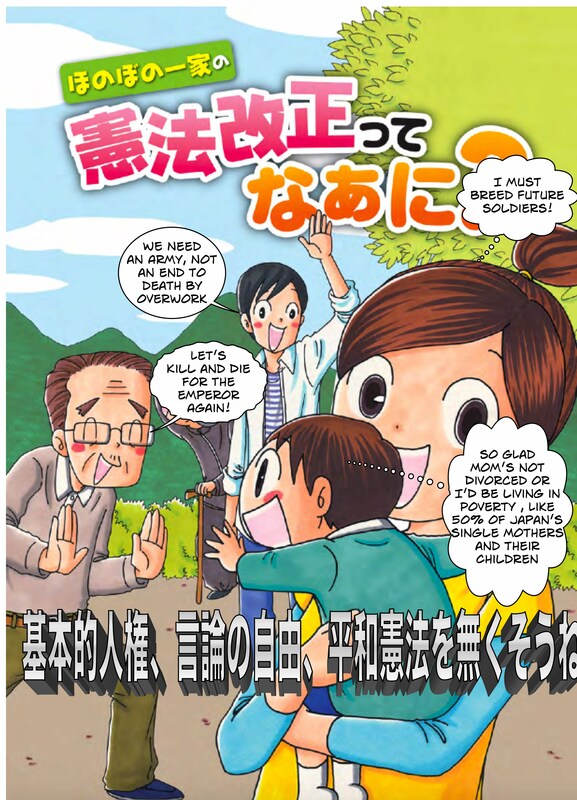 As often is the case in Japan, it’s in what is unsaid that speaks the loudest.